Time at last to talk about the big pop culture event of the weekend... New York Comic Con! (What, did you think I meant that awards show?) Your Book Nerd was there, both overwhelmed and underwhelmed by it all, but having a good time nonetheless. My bookstore had been asked by HarperCollins Publishers to do retail sales at their booth for the Con, so I spent all day Friday and part of Saturday in bookseller mode. I was at first a bit put out to be working when I'd rather be exploring, but it was worth it when I waltzed past the four-block-long line of fans on Saturday morning, flashing my "Exhibitor" badge (the ALP had to wait in line outside for another hour, and it wasn't warm this weekend...) Being on the other side of the booth was interesting -- I can see why my publishing buddies don't look forward to BEA with as much alacrity as my bookselling buddies, since being in the same place answering many of the same questions for 10 hours or more can be a bit exhausting. But it was illuminating, and a prime viewing spot for the craziness of the Con. We sold a lot of copies of this, Scott McCloud's newest follow-up to his classic Understanding Comics (and props to HarperCollins for having this info on their website, AND linking to multiple options for online buying). But we turned away many more eager to buy this, which doesn't go on sale until April. It's a bridge between the first and second movies, and the first release in a collaborative effort between comics publisher Fox Atomic and HarperCollins, which should bring the trade paperback a wider distribution. This was one of many evidences that the comics and "traditional book" worlds are getting together. The Random House booth-complex seemed to cover more floor space than that of DC or Marvel, though it wasn't as flashy (literally -- I saw The Flash flexing for photographs at DC, and later jogging, fairly slowly, across the show floor...) Collaborations are bringing traditional comics characters to bookstore audiences, and many publishers large and small are reaching comics readers trained to love good pop art and design by publishing well-produced works of pop culture. I saw standout gorgeous design books at the MacAdam/Cage, Harry Abrams, and Continuum booths -- less about superheroes than graffiti artists, musicians, memoirists, and artists. But this ain't BEA. This point was driven home sometime on Friday, when a deafening drumbeat drew attention to a raised platform where some costumes I didn't recognize were beating tom toms and then throwing swag down into the audience. A publisher quipped they oughtta try that at Book Expo. The biggest difference, though, was actually the lack of free stuff -- I'm used to the BEA model of lots of industry giveaways, but this show, open to the public, was more about sales. New books as well as vintage comics were all available for purchase, some with show discounts, for any willing fan. I bought myself the sequel to James Kochalka's adorably grungy slice-of-life AMERICAN ELF (talked into it because it also won't be in stores for months). There were also artists, young and old, famous and forgotten, lined up in Artists' Alley, selling their art and signatures to varying audiences. The ALP got his hands on a signed cover by Luis Dominguez, an artist who drew covers for his favorite former Confederate anti-hero Jonah Hex back in the late 60s, and practically invited the old guy to dinner -- a highlight for both of them, I think. The ALP knew a lot more of the artists than I did from longer experience in the comics world, though I did get to say hi to the boys of Gigantic, who published my recent fave Hellcity and will be coming to the bookstore later in March. There were lots of familiar faces on hand, actually -- John Mutter of Shelf Awareness, "heroically" navigating the crowded aisles (his write-up of the show today is far more coherent than mine), along with Todd from Thuglit, Carolyn from Bookstream, and Tom from Norton, and I know there were others around that I didn't manage to cross paths with. All of us book people were walking around with our mouths hanging open and our eyes bulging, taking in the scene of a world where participation in fictional worlds was far more common than we're used to. My favorite, classic Comic Con moment was when I was tearing across the floor, trying to reunite with the ALP, when I was stopped by a cordon of Storm Troopers in full regalia. They were running security for a book signing by Spiderman creator Stan Lee. I love these clashes of worlds, both real and fantastical. The Con seemed to me really more of a Pop Culture Con than strictly comics, which only meant there was more to love. My only regret is that I missed the signings by Brian K. Vaughan and Mike Mignola, the two heroes I was hoping to hero-worship. But there's always next year. Dear readers, not only was yesterday the day-long winter meeting of the NAIBA board (where we were joined by ABA staffers and had a great discussion of upcoming projects), it was also the night of bookstore inventory, which lasted until the wee hours (I left around 2:30 AM, and there were folks still blearily uploading stuff to the computer). As I may have mentioned, I am a girl who needs her sleep. And right now I'm feeling like I have a book-scanning hangover (I'm sure I'll be hearing the beep of the scanner in my dreams). And as my extremely practical and outspoken colleague Pat Kutz of Lift Bridge Books says, "I do need ONE day in my life that isn't all about books. Don't you?" Yes, I do. So I'll see you after Comic Con. I'm going back to bed. Hope some of you are enjoying the three-day weekend and thinking kind thoughts about pres. Washington, Lincoln, et al. Of course, lots of people use their holiday Monday to go shopping, so us retail types are on the job as usual. But here are some linkety-links before I head off to the store. - Hooray, an optimistic article about indie bookstores! This piece in the Christian Science Monitor (from several weeks ago) chronicles some recent success stories, while still acknowledging the struggle (and the fact that none of us are planning on becoming milionaires). It's a nicely balanced piece, and quotes hometown favorite Adam Tobin of Adam's Books (thanks to Sarah Weinman's Confessions of an Idiosyncratic Mind for the link). - Case in point: Waynesville, NC's fabulous Osondu Booksellers, which has just remodeled and installed a wine bar in the bookstore! Proprietor Margaret Osondu is already kind of famous for her campaign get Oprah to visit Osondu Booksellers, and to voice support for independent bookselling. From the looks of it, Oprah would love the place; you can write her a letter and tell her so. - Another cool bookstore discovery: Inklings in Yakima, Washington. Apparently Susan of Inklings heard about this blog at Winter Institute, though I didn't get to meet her. It's a beautiful looking shop; I promise I'll update my links soon to include and the other bookstores I've encountered recently. If you know of an indie bookstore I've missed, by all means email me with their website address and I'll add it. - In the virtual world, I can tell you that this post on Bloggasm about the invisibility of the Litblog Co-Op in Google and other search engines prompted instant action within the LBC; it seems that there was a line of code on the site that kept it from showing up in Google searches, even though it's linked all over everywhere. Sigh... we all just keep learning about this internet stuff, even the savviest among us. Incidentally, this has led to some soul-searching within the LBC about how to best fulfill our mission of "drawing attention to the best of contemporary fiction, authors and presses", and you may see some changes in the next year. But more importantly, the LBC nominees for Spring Read This! have been announced, and one of 'em's mine! You may remember me raving about Mark Binelli's SACCO AND VANZETTI MUST DIE! from Dalkey Archive; well, now at least 24 bloggers are gonna be reading it, and we'll have interviews, roundtables, and podcasts galore. I'm also thrilled about the other two nominees, Marshall Klimasewiski's THE COTTAGERS (Norton) and Alan de Niro's SKINNY DIIPPING IN THE LAKE OF THE DEAD (Small Beer Press); they're all titles I've been meaning to read, and from some of my very favorite indie presses. Just another reason to look forward to spring! - Bookseller Chick and I have been trying to figure out how y'all are doing this blog reader / RSS feed thing, and even asking for suggestions. One of the tools suggested was JacketFlap.com, and I just got a nice email from those folks telling me that my blog is featured there (you can see how here). But in the meantime I've discovered that Google Reader is pretty easy, and I can set it up so that new blog posts appear on my Google homepage along with the local weather. I worry a little about contributing to the Google take-over-the-world project (see Scott Esposito's thoughtful post on the concept of "transformation", and many others on the iffyness of the Google BookSearch project), but it is helping me keep up my blog reading a little more; I wouldn't have discovered Scott's post without it. Hmm. - Scott also mentions the Jonathan Lethem article from Harper's on copyright, borrowing, and plagiarism (he's sort of in favor of it). I've had it passed on to me from several sources and I'm working my way through it; it's pretty long, but it's Lethem at his pop-culture-crit best. - And just for fun, here's a hilarious video from YouTube about the IT Help Desk in the era of Gutenberg, when "book" was a new and confusing technology (thanks to Dan at the ABA for the link). Some more book reviews coming later this week, and then I'll report back from Comic Con! Enjoy the day, and happy reading. Mmmmm.... sleepy today, as a result of a late night last night and an early meeting this morning. It's probably too late for any of you to read this post at work today, but I've got the time to get it off my chest and leave time for links on Monday. It's been ages since there were any book reviews around here -- anyone ever notice that the more involved one gets in the book industry the less time there seems to be to read? Actually, I think that's a fallacy, but I have seemed to be in the reading doldrums until recently. What I have had the time and energy to read has been fairly escapist fare, though not stupid by any stretch. I was tempted to describe my January books as "diet reading" -- a take on the "light reading" idea -- but really, it's more like candy reading, or junk food reading -- though it's not junk, just on the more fun side than the intellectual side -- oh, the whole food metaphor breaks down. Just read the reviews. I'm a fan of Neil Gaiman based on his great, great fantasy novels NEVERWHERE, AMERICAN GODS and its recent sequel (of sorts) ANANSI BOYS, though oddly I've never read his most famous work, the epic and groundbreaking SANDMAN graphic novels. I'd been saving this short story collection like a box of chocolates for my Christmas vacation reading, but it took me a little longer to get to it, and when I did I have to admit I was at first disappointed. Perhaps this is because I'm such a fan of Gaiman in the longer novel format, where there's time to develop the resonances of his mythical allusions, and the running gags are more effective. In any case, I thought this collection was a bit hit-and-miss. Gaiman sometimes styles himself a bit of a fantasy rock star (check out his author photos with the leather jacket and brooding expression), and sometimes it seems as though he's bought his fans' idea that he can do no wrong. In particular, the "poems" included in this collections were a little cringe-inducing, and the short pieces (including the liner notes he wrote for an actual "rock star") and several of the stories seemed to set up a spooky premise, then abandon it in despair. The introduction, while illuminating the circumstances of writing several of the pieces and acknowledging their allusions, were a bit too much about the awards and accolades each story had received. The collection started to seem like an overindulgent double album, and I began to be a bit annoyed. But just as I was about to give up in despair myself, tossing the book aside with the impression that ol' Neil just hasn't got it anymore, a couple of the stories totally wowed me. The alternate history "A Study in Emerald" puts Holmes and Watson in the service of a British royalty far different from the one you remember; the language is completely Doyle-esque, and it takes a while to figure out the catch. "Sunbird," which was included in a great McSweeney's anthology, is a hilarious and delicious cautionary tale for foodies. "The Monarch of the Glen" picks up the story of Shadow, the hero of AMERICAN GODS, as he encounters another set of myths in a remoter corner of Scotland and tries to figure out who's side he's on; it's one of the longer pieces, and showcases Gaiman's skill at working ancient figures into the contemporary landscape. But my favorite was probably the early story "Forbidden Brides ofthe Faceless Slaves in the Secret House of the Night of Dread Desire" -- how could you resist a title like that? Its hero is a writer of "realist" fiction who happens to live in a fantastical villa where epic, tragic, and supernatural events occur with monotonous regularity, who eventually embraces his desire to write "fantasy fiction" about relationships in suburban kitchens belonging to insurance adjusters. It's a cheeky answer to critics of "escapist" fiction, honoring the writer's right to invent worlds that he or she can love. At his best, Gaiman creates such worlds with incomparable skills and amazing creativity. Despite its flaws, this collection is worth reading for glimpses of those worlds. So there I am in Powell's City of Books, possibly the biggest independent bookstore in America, and what do I purchase? Two t-shirts and a Young Adult fantasy novel in remainder. I would be embarassed, except that 1) the t-shirts are supercute (look for a Fashion Issue of the blog soon), 2) any non-remaindered book I could get at my own bookstore and at a discount, so a remainder is really quite a logical purchase, and 3) this book was recommended to me in glowing terms by none other than Bookseller Chick. She tells me that she's actually sold it to far more adults than kids, and I've added it to my own pantheon of delectably smart and suspenseful fantasy that shouldn't be left entirely to the under-21 set. You've probably heard of this writer and his trilogy: it's alternate England again, where magicians are the ruling class and perform feats of magic by carefully summoning demons, or djinni, from the Other Place. The djinni, of varying degrees of supernatural power, are either evil or just annoyed at being slaves, depending on whom you believe, and the magicians are constantly scheming against each for power and advantage, so it's a dangerous world. We're narrated through it primarily by Bartimaeus himself, an ancient djinn who's been called up by a precocious underage magician named Nathaniel who has revenge on his mind. What I found interesting about this book is that while you're rooting for B. and N. to triumph (and there's lots of suspense about whether they will), neither are exactly morally admirable, and neither is anyone else. Nathaniel has a sense of fair play which is apparently quite unusual among magicians (no one's sure where he got it from), but he's primarily a punk kid hoping to punish his enemies, and he's also an insufferable classist snob about "commoners." (The class struggle is a theme I suspect continues to grow in the following books, and I thought magic as a metaphor for inherited class privilege was an interesting and effective one.) Bartimaeus, while bound by a series of spells to serve Nathaniel, is a ruthless and conniving old-world sort of creature, though leavened by a wit that makes him seem something like the Artful Dodger or Charlie Croeker from THE ITALIAN JOB (he could have invented the Self Preservation Society). I'm looking forward to reading the following volumes to find out whether these self-serving heroes go through some kind of moral maturation, or whether the amoral nature of their world means they are heroes simply by virtue of being the novel's protagonists (and not quite as bad as some other people). In any case, Stroud's writing is clever and fast-paced (more in a Dickens sort of way than a Dan Brown sort of way), and he wisely never spends so much time explaining the practicalities of the magic that he forgets his characters. Much of the explication is told through Bartimaeus' slightly sneering footnotes, which makes it funnier and easier to absorb. I tore through this one in a couple of days, relieved to have something that truly made me look forward to the subway ride for a few minutes of reading time. It was followed by a couple of other winners, but I'll save them for next review post. Question to the readership: how do YOU describe the opposite of heavy reading? Is there a kind of non-judgemental language about this kind of genre fiction? Or should we just admit that it's a guilty pleasure? 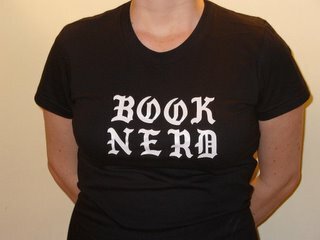 Ready for some links, O my bookish friends? * Here's that piece in Bookselling This Week about the Book Nerd experience at Winter Institute. Read for all the bits you didn't get here. ""Create the store for the 21st century. If you do it well, you'll give customers a reason to come back. But you can't do it by making them feel guilty." Well said, sir. I'll be watching the continuing saga of Booksmith with interest -- and optimism. * Have I talked at length about the exciting newness of the New Atlantic Independent Booksellers Association' fall show? No? No longer a "trade show" in the traditional sense (with an emphasis on the publishers making sales on the show floor), this one will be more of a "bookseller sales conference", focusing on bookseller education and allowing publishers to help us pitch the best of the books we've already bought, for more sales all around. I've been talking with President Joe Drabyak (who was there in full force at WI, though we somehow missed each other at all the parties) and the rest of the board about our plans for the fall (in Baltimore, hooray!) and getting excited. And I believe henceforth the fall show should be known at NAIBA CON! The debate, while a somewhat hilarious example of something that would happen only in Park Slope, speaks directly to the serious question of the role a neighborhood bookstore plays or should play. Is it a place to "come in, buy a book, and leave" as one OTBKB commenter believes? Or a place to meet friends, hang out, kill time, browse? What responsibility does the bookstore have to both kinds of bookstore-goers? When does one person's right to browse infringe on another person's right to buy? Should we be focused on serving hurried paying customers, or on creating a welcoming vibe? I sympathize with B&N in this case; it's a hard question that involves compromise however you look at it. In even stranger Park Slope news, cool young bookstore Adam's Books (a passionate favorite of the ALP, and a place I'll be forever indebted to for my mass market copy of WINTER'S TALE) has become Unnameable Books. You can find the brief version of the reason why at the old Adam's Books website; it seems there's a textbook distribution company in Brooklyn called Adams Book Company, which has threatened to sue (or otherwise inconvenience) the tiny bookstore. While I don't know the legal realities of the situation, it does seem like an unnecessarily thuggish move on the part of a company that it doesn't seem could have any real overlap with a small general bookstore (read this letter Brooklyn writer Amy King sent to the "other" Adams pretty for a strong argument to that effect). Luckily, the new name is pretty cool And you can't keep a good bookstore down. I suspect that Adams' (not Adam's) insistence on their right to the name will end up making them look bad and will bring more publicity and customers to Adam's/Unnameable. If you're a New Yorker, visit bookstore on Bergen between 5th and 6th (just down the street from the Bergen Street 2/3 subway), and tell him you're happy to shop there whatever the name. That's it for today -- happy reading! Somehow I found myself drinking later and more often at this event than even at BEA with its host of publisher parties. One theory is that when one isn't exhausted by a day on the show floor there's more energy for going out. But the day sessions were plenty rigorous and intense (and in case any of my coworkers are reading, I DID learn enough useful stuff to justify you covering my shifts last week). My theory is that Portlanders are secretly way hipper than anyone in the world, and have a higher alcohol tolerance, which they inflict on folks like us hapless Easterners. Or maybe there were just a lot of awesome people there that I don't see too often, and it was irresistible to hang out with them when I could. I blame much of the merriness on Dave Weich, a young bigwig at the Powell's online operation with a particular devious grin. Seems like every day around 11 pm he was there asking "So you coming out?" The first evening, Wednesday, we convened on his home turf, the big Powell's City of Books in downtown Portland. (I had met Good Yarns manager Amanda in La Guardia Airport, and Breathe Books owner Susan in front of the hotel, so the posse was already beginning to gather.) I greeted with joy Len, Dan, and Avin from the ABA, Lance Fensterman of BEA, the fabulous Georgie of Tin House (whom I'd only known via email before), Megan of Harvard Books (and Bookdwarf fame), Henry of my hometown Book Court, and Sylla, Julia and Alison of the Emerging Leaders crew. We mingled among coffee and snacks, and were treated to a tour of Powell's back office; holy cow, those people buy a lot of used books. The sheer scale of the operation was astounding (over 200 employees work just at that one location), and it became a bit frustrating as I never did have time to explore the bookstore the way I'd like. Just have to go back again, I guess. So as the reception wound down there was Dave, and he dragged the lot of us to Tugboat, one of an apparently infinite number of amazing local brewpubs in Portland. Megan and I promised each other "one drink and we're going home" (another common refrain), but those Powell's folks, and the authors they brought along, are just too much fun, and we imbibed and chattered about booky stuff until the wee hours. Ah yes, then the Institute itself began. The Doubletree's sausage-and-egg breakfast menu (it was a week of hotel and airport food – how do business travelers do this?) helped the revival process, and Daniel Pink's presentation on the right-brain revolution was a good way to wake up. Amazingly, I was able to comprehend the numbers at the ABACUS lunch on indie bookstore financial health (and I feel yes, there's room for cautious optimism). ABA CEO Avin Domnitz's educational session on financial documents put the fear of God (or accountants) into me, though I came out speaking that language far better than when I went in. It's generally conceded that the Design session wasn't as good as was hoped – I was expecting a session on bookstore interior design, that most powerful tool of brick-and-mortar stores, and ended up getting a primer on graphic design, but it did get my brainstorming started for potential logos. I lingered by the door of the Sales Rep Picks session, taking in the biggest buzz (GOD OF ANIMALS, check it out in galley) and sneaking off to my room for phone calls and a nap. The big author reception in the evening was great, and I found Toby of Three Lives, NYC prospective bookseller David del Vecchio, and Amanda and Lance again, while getting books signed by Nathan Englander, Frank DeFord (whom I listen to on WNYC as the only person who could ever make me care about sports), and other luminaries. There was, I kid you not, a chocolate fountain on hand at the reception; I'm not sure who sprang for that. I dipped a strawberry, but I gotta say it was not the coolest thing I saw all weekend. I was fortunate enough to be invited to a dinner by MacAdam/Cage, along with my store's owner Sarah McNally; we taxied to a lovely restaurant, the name of which I've forgotten (there was a lot of money spent on taxis last week by out-of-towners doubting their skills at navigating the light rail). We had a great time talking with a woman from the supercool Book People in Austin, about how her store uses Above the Treeline, as well as the tabloid-worthy events involving a BookPeople employee and a deadly love triangle a few years ago. (It was all in the papers; you can Google it.) But I had to leave after the appetizers (and before any of the MacAdam/Cage authors had arrived – sorry!) to make it for the beginning of the Emerging Leaders reception at 9:30. I should mention that I'd managed to hobnob earlier with EL founders Julia and Allison, and new Emerging Leaders Council appointees Sylla, Megan, Sweet Pea, and John (you'll have to forgive me that I can't tell you what stores each of them belong to; I don't have all their info in writing yet, the Council is that new). We've got almost all of the regional organizations represented on the Council, and as it's a very loose organization at this point we'll be soliciting lots of opinions about what we should do, who should be involved, etc. In fact, that was the point of the EL Reception (aside from the free drinks, of course, graciously provided by Donna Paz & Associates, the booksellers school). There were of course more mingles and then a call to order and introductions (when I outed myself to the room as The Written Nerd, there was a small cheer – aw, thanks, guys!). Then we busted up into groups to brainstorm 1) how can we disperse information and reach potential ELs most effectively and 2) what does everyone want from Emerging Leaders, from the ABA, etc.? Many notes were taken, and will be compiled and acted upon; we've already got a listserve/forum going that will continue to grow. You'll hear more about this, I suspect; it could take up several posts on its own. So I missed breakfast the next morning: a first for me. (I'm sorry, ABA! But I'm planning on participating in the Strategic Planning Survey online instead.) I made it to the first ed session, Meg Smith's "How to Be the Story" about bookstore PR, which was awesome – I'm going to be looking at my notes for that and hopefully putting something together for both my current and future bookstores. More rep picks followed, which a few of us New Yorkers felt we could justify skipping; we're lucky enough to see our reps fairly often, so we get the new book scoop from them. Toby, Amanda, David and I went out in search of coffee, and found ourselves in a great diner ordering brunch; the waitress irresistibly pitched the salmon eggs benedict as "the world's perfect food" and she wasn't wrong. Over brunch I got to hear David's brilliant plan for a New York bookstore; you'll have to ask him for the details as I don't want to steal his thunder, but it made me excited about my hometown's bookselling scene, and the general level of brilliance of the prospective booksellers at the Institute. We returned in time to catch the New Media Lunch, which was eye-opening in some ways and reinforced everything I thought in others. Reps from RH audiobooks, Salon.com, Google Book Search, and O'Reilly media started their panel discussion by unanimously agreeing that print books aren't going away; the "digital revolution" will be more about "added value" and new means of reaching customers than about the replacement of paper with electrons. Wish I had taken better notes, but I suspect John from Shelf Awareness did; check out all this week's issues of the e-newsletter for his excellent reporting on the events of the WI. My state of exhaustion may have had something to do with my failure to comprehend anything about the Advanced Above the Treeline session I went to next, but I think that has more to do with the amount of actually advanced users there were in the room, asking questions about the inventory tracking system that were way over my head. I need to poke around in AtT a lot more before I can even ask those kinds of questions. I headed up to my room for a nap, but found myself coming down again an hour later, sitting in the hotel bar with Toby, Amanda, David, Avin and some other booksellers, rehashing the Institute and the world of books in general. Realizing I needed to pack, I returned again to the room, as Susan of Breathe and John of Shelf Awareness had arranged for a bunch of us to meet for an informal dinner that evening. The lot of us, along with Jenn of Shelf Awareness and the owner (whose name I forget) of Creekside Books, ventured out in search of a good meal. Susan, who proudly claims the phrase New Age to describe her store, had a good vibe from a Thai place we initially rejected, and I gotta say her higher self made a good choice. Shelf Awareness treated us to a good spicy meal (no hotel food this!) and good conversation flowed, as always. Around 9 I was already late for my date with Bookseller Chick, who was going to meet me at Powell's. I reflected on the weirdness of being a chain bookstore employee in a city dominated by an indie – a little role reversal? Turns out BS Chick knows her way around the City of Books, and let me explore a little before we headed out (I even bought a book on her rec, which I'm currently devouring). We then found ourselves at a pub called Rogue (whose microbrew I've had here in Brooklyn), talking a mile a minute about her store's closing, the Institute (which she longed to attend), her future plans, my future plans, and life in Portland and Brooklyn. We left to check out a coffee shop with an innovative design she thought I should see (it was worth seeing! ), and the walking tour of nighttime Portland was almost the best part. I can see how a bookish girl could find a home there, though it's no Brooklyn. We had hoped to meet up with Bookdwarf and make it a book-blogger-chick summit, but cell phone malfunctions scuttled those plans. We ended up at BS Chick's apartment (oh, the glory of non-NY real estate! ), then back in my hotel room, because we kept having more to talk about. You know how it is when you get booksellers talking, and it was great to hear about the joys and frustrations on the "other side" of the indie/chain divide, and the vast amount of commonalities in our experience and ideas. I reluctantly kicked the lady out around 2, so I could get an hour or two of sleep before I had to get up to catch my flight. I got a cab to the airport at 4:30 with fellow NAIBA board member Rob of Colgate Books, and then found myself on the same flight with the inimitable Lance Fensterman. I'll only mention because he said it would make good blogging fodder that the first leg of the flight I was seated in the midst of a group of 8th graders on their school trip to Washington, D.C., which didn't do much for my great desire for sleep (and revived my suppressed horror of the movie Final Destination). The stopover in Minneapolis reminded me that there are places colder than New York right now (13 is bad, but -10 is worse), and I was home in the arms of the ALP in another couple of hours. As with all meetings of booksellers, I came out of the Winter Institute reinvigorated (if spirit if not in body), and grateful for the community to which I belong. Any group of conventioneers can party; not all of them have the kind of conversations, both official and unofficial, that we had last week. As Avin said in the hotel bar, the ABA just provides the space -- the booksellers create the vibe, and create it they did. Thanks to everyone who was there and made it happen – and feel free to share your stories too! Okay, folks, you'll have to wait until Wednesday for the big, long, rundown of the ABA Winter Institute in Portland (note: I vote that we start referring to the event as "we," like the new video game platform Wii, and because it's all about us - er, we. That started out clever and got silly.) Today it's all about catching up on the stuff that's happened in the meantime. I may still be suffering from some remnants of jetlag, so forgive the irreverant (or incoherent) tone. * In the "uber-indieness of the one counterbalances the corporateness of the other, all for the benefit of literature" category: the Litblog Co-Op's Fall Read This! pick, Sam Savage's FIRMIN, has made the finals of the Barnes & Noble Discover Great New Writers Awards! We like to think that we, the rat-obsessed bloggers, had a teensy bit to do with this. Either way, go Firmin! * Also in LBC news, there's a pretty sweet roundtable discussion going on there now about Ngugi wa Thiongo's WIZARD OF THE CROW, the Winter Read This! winner. If you have any interest in Africa, fantasy, education, the benefits of reading introductions, or confessions from famous bloggers, check it out and chime in (my bit will be up there later this week). * In the "It's about time!" category: Rebel Bookseller and entepreneur extraordinaire Andy Laties is running with the brilliant idea of Bookstore Tourism founder Larry Portzline to create BiblioExpeditions! It's an expansion of the Bookstore Tourism project, and if anyone's going to pull it off it's Andy and Larry. Check out their progress on the new BiblioExpeditions blog. * Ooh, this is fun: New York listings magazine (and source of much cheeky fun) L Magazine is starting up their Literary Upstart contest: basically an open-mike fiction writing showdown tournament, with publication as the prize. Much drinking is involved, apparently. Any takers? * Okay, just one report from WI, but an extracurricular one: I MET BOOKSELLER CHICK! (Reports of her retirement from blogging, by the way, have been greatly exaggerated, by me; I meant to say, "The bookselling world is about to lose..." etc., as she will continue to blog despite her store's closing). We had a totally awesome five-hour gab session on Friday night (and if you know how much I like my sleep, you know what it means that I went to bed at 2 when I knew I had to get up at 4). More on the substance of the talkin' later, if I can remember it, but it was a great time and a great tour of Portland after dark. You won't hear her real name or corporate former home from me -- I'll leave that to her to reveal in good time -- but you will hear that it was every bit as cool as talking to my fellow indies in the WI sessions. Thanks, BSC -- hope you're getting some sleep too! Okay, that'll do for today. Do check back, dear readers -- much reporting ahead.